Bellinis, Cipriani and Downtown Soho. Three words that Ambre and Andrew would’ve never recognized in a crystal ball depicting their own futures, were it shown to them sometime before a certain December in 2007. Nevertheless, this is where their paths aligned, the origins of a duo of shape-shifters, art-makers, and die-hard collaborationists. While Ambre obtained her Masters in painting in Italy during the two years before their meeting, Andrew was busy conducting ‘field research’ in a mental institution for a creative project, yet to be released. Unknown to them at the time that those divergent paths would conjoin, their meeting culminated in a live-in secret lair in East Williamsburg, where a multitude of projects and inspirations have their beginnings. Pop-up art events, “BoyfriendGirlfriend”, “The They Co.” and “The Underground Library” are just some of the buzzwords that give an idea about their collaborative undertakings. Team Kelly/Gori have created a multi-facetted life, and help Nolita’s Old School on Prince Street maintain its status as a cultural nexus. Tell us about the space in Soho/Nolita – how did you come to it? Andrew: It used to be a catholic school, one of the first in NYC – built in 1825. We organized art shows in a gymnasium on Mulberry Street and through circuitous ways, got to know some of the people at the Cathedral who look after the space – and figured out a great collaboration. Please tell us a bit about The They Co.
Andrew: The They Co. is the pragmatic umbrella under which we perform most of our logistical activities. As creative consultants, we’ve aided and abetted galleries and art organizations along with individual clients within the art sector. Ambre: Before starting a consultancy of my own, I was venturing away from my goal of helping emerging artists and helping myself as an artist in the work I was doing. We founded The They Co. to be the workhorse on whose back our larger creative projects could ride. How are you selecting whom you are working with? Andrew: Some people reach out with interest in the Old School space. That’s how we met Amani Olu with the Humble Arts Foundation, for example. There’s that group of people whose interest in the Old School initiates contact and then a more personal collaborative relationship develops, and then there are people we meet through friends, like curator Jamie Sterns with Envoy Enterprises, or independent curator Cecelia Stucker. You are both active as artists? Andrew: I’m a filmmaker by education and a writer by practice, and Ambre’s origins steep in classical and contemporary art. One and half years ago, we started to collaborate creatively under a joint moniker named “BoyfriendGirlfriend”. The idea is to use medium constraints per project to ruminate on different elements of human relationships. By choosing a medium we are both bound to, we create work independently with the same materials, and then use our observation of the shared themes within the individual work to build a “co-dependent” singular work. Ambre: This process helps express the odd duality of any relationship. There are two compatible but completely separate identities – free to implement their own perspective, free to relay their own ideas. It seems like you are very conscious about maintaining your own identity? Ambre: It helps to be creative for our own art work as well, where we have private moments to be in our own space, to get back to the self a little bit. This helps to keep it all balanced. During New York’s Armory Art Show this year, you compiled the so-called SPRING/BREAK Art Show. What is the concept behind it? Ambre: Our idea was to create a curator-driven art exhibition that could represent a kind of humble ‘improvement’ on the art fair model. A unifying theme would envelope the numerous exhibitions in the space, the sales of which would be commandeered by this overarching idea rather than simple trade show tradition. We invited 23 curators and offered space in the Old School. We called this first iteration Apocalist – A Brief History of the End. Andrew: The idea was to exhaust the 21st Century fixations on The End. What’s the artwork in the courtyard? Ambre: You can see it from Google Earth. Molly Dilworth was commissioned by Hendershot Gallery to execute one of her large-scale antebellum paintings in the old recess courtyard of the Old School during the New Museum’s Festival of Ideas for the New City in 2011. What are your biggest achievements and challenges? Ambre: We put on these incredibly compact five hour art events in an old gymnasium with only an hour window for set-up and break-down on either end. We were really young, and did it to showcase the high caliber new work by artists we were finding, but the whole idea was logistically grueling, and half insane. An ongoing challenge of ours is to say no to things. Where are you both from and when did you come to NYC? Ambre: I am from South Carolina and moved here in 2006. Andrew: I grew up in Connecticut, in an idyllic town called Collinsville, and then went to Bard College to study filmmaking. I moved to Brooklyn in 2008 and started working for a few major filmmakers, and built The They Co. with Ambre shortly afterward. Ambre: We met on the sidewalk, outside of Cipriani’s Downtown. Andrew: Not familiar territory for either of us, you can imagine. We were introduced by a mutual friend. We sat by the bathroom, discussing psychic underpinnings of The Never-Ending Story. Is this the first apartment you have lived in together? Ambre: Yes, we’ve lived here for four years. Andrew used to live down the street, which is how we discovered this place. Did you decorate it all together? Andrew: We keep adding here and there. For example, this piece is new. It’s an engraved plywood painting by Brent Owens – a kind of lush tapestry made from pedestrian materials. Everything in the space acts as a creative talisman. What’s your favorite thing about the apartment? Ambre: We haven’t summer-ized it yet. The grape vines will create a canopy by August. There is a 150-year-old fig tree, which Italians that lived here planted. We also have a little fishpond. Andrew: When we came see the apartment, there was this blooming rose outside, just one – encased in glassy ice, like out of the fable of Beauty and the Beast. It was literally inviting us to move here. What about all those chairs? Ambre: I love chairs. I can’t get rid of them. This magenta chair we found in the Upper West Side and carried it through central park and then painted it – per our CMYK obsession. Chairs are like these really anthropomorphic pieces of design. I really relate to them. What’s your favorite place in the neighborhood? Ambre: Coffee shop (The Tar Pit). Tell us about the two bedrooms. Andrew: Those two rooms actually look exactly how our rooms looked in our old apartments. 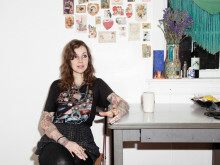 Ambre: When we moved in together, we decided to structure our rooms this way, so it wouldn’t be such a huge transition. Plus, it’s more fun to do sleepovers at his or hers. Please tell us about those handmade books. Ambre: We are involved as Members and contributors to a group of clandestine underground publishers called “The Underground Library”. Members sign up for a certain amount of books for a period of time, and are sent them in the mail. The Member receives the book and there’s a library card inside that is pre-dated. They have to read the book, sign the library card, and then pass the book to someone that they think will like it. It has to pass 12 hands and then returns to the original Member – it has an envelope in the back with the Members’ info.